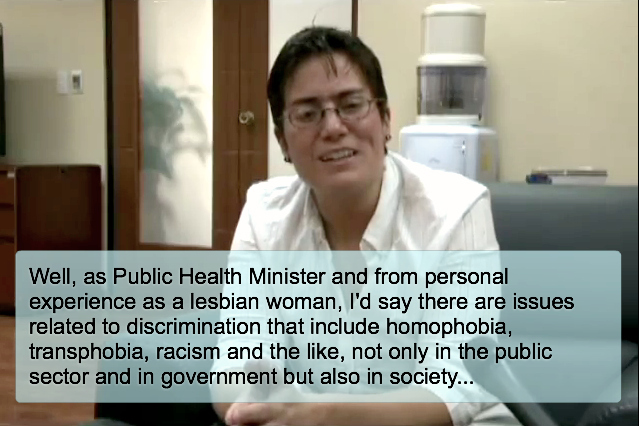 Blabbeando: Ecuador's Health Minister: 'Ex-Gay' clinics are "shocking evidence of the prejudices we hold as a society"
Ecuador's Health Minister: 'Ex-Gay' clinics are "shocking evidence of the prejudices we hold as a society"
In January I wrote about lesbian rights advocate Carina Vance being named to the Rafael Correa's presidential cabinet in Ecuador as the country's Health Minister. The stunning news coincided with news that the government was finally taking action in shutting down clinics that were promoting treatments to "cure" homosexuality. Efforts to raise awareness about these clinics were led by Fundación Causana, which Vance used to lead, and were the basis of online campaigns from Change.org and AllOut.org. Both organizations celebrated victory based upon the news and members of Fundación Causana sent a photo thanking AllOut.org and their followers for making a difference. The news quickly traveled around the world with the Associated Press and CNN running initial reports. But it was weeks later that The Christian Science Monitor published the most comprehensive report on Vance's appointment and the existence of these clinics ("Ecuador clinics said to 'cure' homosexuality stir debate", Feb. 10, 2012). The government last year publicized the closing of 30 centers, though gay rights groups say it was only 23. The clinics were all shut down because of minor infractions, such as expired medicines, lack of fire exits, and lack of hygiene. Some did not even have a valid license. Most opened up again after a few days. Gay rights organizations say the government is not doing enough to investigate crimes and close illegal operators for good. However, Carina Vance, a prominent gay rights activist who was appointed Ecuador's minister of public health last month, says the government is committed to a long-term strategy to change the clinics. “It is a complex and urgent issue that needs a comprehensive intervention,” says Ms. Vance. When Vance was appointed to the Health Ministry in January, she was taking over an office that seemed to be in disarray and was charged with restructuring the country's health system to make it more effective. By all accounts, she has hit the ground running and has had little time to sleep. Although local media have barely covered the situation with the clinics, Ms. Vance has made several statements to international media on the issue and has promised to address the situation. And last week, on February 17th, the Health Ministry released a 10-minute video in which she addresses the issue head on. It's short on specifics but indicates there is commitment. Below is the full clip (turn 'annotations' on to read my on-screen translation). Full English language transcript below the fold. Q: What is the Public Health Ministry's take on claims there have been human rights violations at rehabilitation centers? Vance: First of all we have to agree that the State must guarantee the rights of the people and, in the five years since Rafael Correa became the president, there have been greater efforts to strengthen the capacity of the State to guarantee those human rights. There is still a lot of work to do and the situation at the rehabilitation clinics - about which we have received serious allegations about human rights violations - puts into evidence all the work that still needs to get done. From the vantage point of the Public Health Ministry - and as the Health Minister - I am clear on this and we have some strategies to strengthen the Ministry's response regarding this situation. Q: What is the Public Health Ministry doing about the situation? Vance: As a matter of fact we are elaborating a judicial strategy from the perspective of the State's obligation to guarantee human rights. And that means there are some legal instruments that need to be reformed. There are current regulations that define the way these establishments should be managed and our proposal is to link them to the constitutional mandate - the new Ecuadorean constitution of 2008 - that guarantees human rights for all. It's not only about a lack of government oversight. Why is this an issue? Because in this society we have situations in which individuals enter [these clinics] due to alcoholism or drug addiction, but also those who behave in ways that do not match the existing social norms. For example, a young man with long hair or a person who dresses in a manner that is different to what his parents deem appropriate may end up in these centers for an intervention - supposedly to change their behavior. Instead, we see a clear violation of human rights - and the complaints say just as much. At the moment, we are analyzing the regulations and the tools that exist in order to bring them in line with the mandate established by the constitutional reforms and by the government's policy that, in effect, is to defend and guarantee human rights for all. Q: Regarding allegations of homophobic attitudes among political appointees. Vance: Well, as Public Health Minister and from personal experience as a lesbian woman, I'd say there are issues related to discrimination that include homophobia, transphobia, racism and the like, not only in the public sector and in government but also in society. It's a challenge that has to be confronted not only through the controls and policies of the State as the body that guarantees these rights, but there also have to be efforts made by our society. And that's where the work of the Public Health Ministry becomes fundamental because in order to improve public health you have to work with the public. You have to work on strengthening the participation of the civil population in the actions taken by the government. But, as I said, there will be public servants and government representatives who will hold prejudices against certain individuals when we come from a society that holds prejudices against those individuals... a society where homophobia does exist. People who belong to the LGBT community often have to endure these type of situations in their normal day to day lives. Those who end up at the rehabilitation clinics - and what we have seen in the majority of these cases - is that they have been brought there by their own families. We have to work with those families. We have to work with the roots of the cause. And I'm not providing a justification that gives government a pass on its responsibilities. It has to be both. If we don't tackle both issues we won't get a sustainable response. It has to go hand in hand: An effort to educate and break up the myths and prejudices that exist in this society and, at the same time, a government-led response with the understanding that the State is the one that guarantees the human rights of all citizens. Q: How does the current constitution strengthen the rights of the LGBTI community? Vance: It is evident that changes made through the judicial framework can be incredibly important as long as they go hand in hand with other types of strategies. 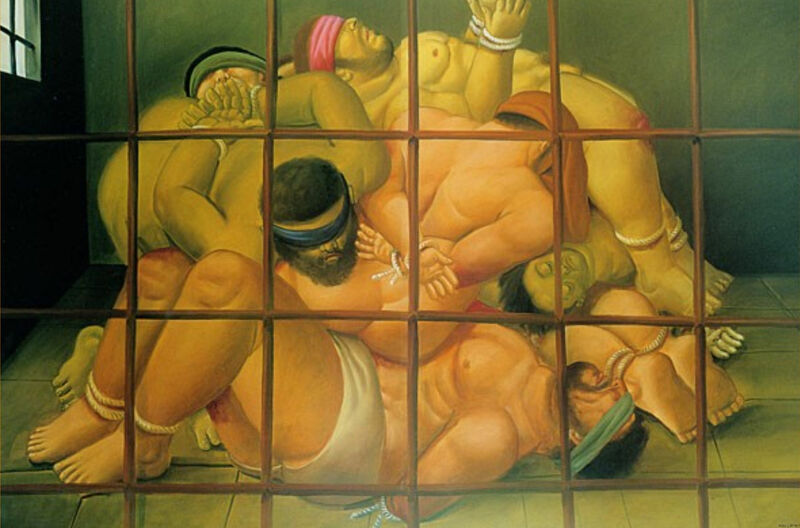 Remember: Homosexual acts between men were still legally penalized before the 1997 constitution was approved. And, specifically, it did say 'homosexuality between men'. When the constitution changed, it generated an opportunity to strengthen the work regarding civil society and the protection of the rights of the LGBTI community. It is evident that there was a change in norms and this has led to a certain rupture - thanks to the work of organizations from the civil sector - a rupture that made it possible for the civil sector to strengthen their work on these issues. Similarly, I believe the 2008 constitution has to be one of the strongest constitutions on these rights... in guaranteeing human rights, people's rights, it also establishes a rupture. But on the legal side, preventing it from becoming just a piece of paper requires a lot of work not only from the government - which must follow the constitutional mandates - but also from the civil society which has the more complex task of changing the mental schemes that we have as a society which are discriminatory in many different ways. Q: What is your opinion on treatments that offer a cure to homosexuality? Vance: The concept of "curing" homosexuality is evidently based I believe on the concept of fearing diversity. And it has been decades since the World Health Organization as well as other entities related to health have determined that homosexuality is not an illness and does not have a cure. What we need to cure are indeed those prejudices that still exist in society. That's the way it is written in the constitution of this country and it's difficult work that we need to do on a daily basis. But I believe we have made great strides. Q: What would you tell a person who has been a victim of these treatments? Vance: That we are conscious of the urgency needed in our response to this situation. And I would say that the existence of these clinics that perform these type of treatments is one of the most visible and shocking evidences of the prejudices we hold as a society. I believe that the discrimination and these prejudices are still present in day to day life and requires work from the government in taking responsibility of the actions and controls that should be taken. But I would also say that it requires breaking the silence and that this requires sacrifice. I believe that without this, without breaking that silence, without denouncing these type of situations - with the sacrifice it demands, which I know is very, very difficult in some instances - without doing this we won't achieve change. And I believe that just like our constitution establishes a rupture, similarly we would have to establish ruptures and one of those ruptures is to break the silence.